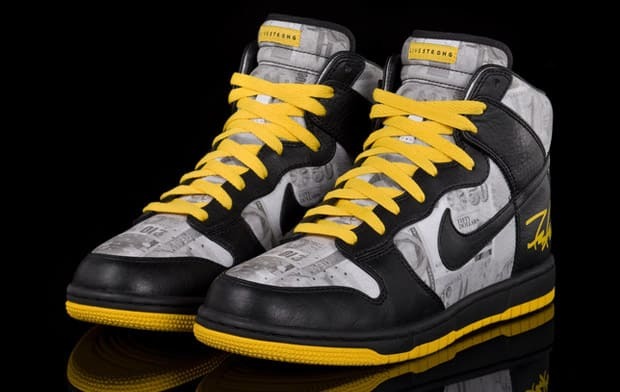 Livestrong x Futura x Nike Sportswear Dunk High "FLOM"
Here&apos;s a fact: Lance Armstrong is a much better athlete than you. Here&apos;s another fact: Nike makes Lance&apos;s sneakers better than other professional athletes. Tomorrow, this LIVESTRONG x FUTURA X Nike Dunk High FLOM release to top-tier outlets like DQM, Concepts, Goods, Huf, and UNDFTD. Not only are the Dunks one of the best smu&apos;s we&apos;ve seen in a while, but 100 percent of the proceeds will be donated to the Lance Armstrong Foundation for Cancer research. Everyone wins. Cop them for $150, and if you haven&apos;t already check out Nike and Lance&apos;s new video for the Stages All Star Art Show.